Regain the wisdom and creativity of our ancestors who were experts at whipping up something special with tight budgets and limited supplies. You may not be able to find the “10-cent bag of marshmallows” anymore, but modern cooks can still benefit from this collection of 1920s vintage recipes collected by my late Grandmother. In 2012 I discovered her handwritten recipe notebook from 1926 and developed this cookbook. While updating the directions for modern cooks, I maintained the vintage charm of her original notes. Generations ago people did not have a bunch of fancy ingredients, but they still came up with a variety of yummy quick breads, cakes, desserts, pies, salads, main dishes, canning recipes, and fruitcakes. This cookbook has a special emphasis on fruitcakes. I share my mood-altering experiences with her fruitcake recipes. Bakers who love the holidays should definitely add a classic Christmas fruitcake to their list. All jokes aside, fruitcake deserves a place among elite holiday desserts. And people into urban farming and homesteading can harvest delicious value from these vintage recipes meant to use up all the dried fruit and nuts you can pick. Plus find a variety of classic uses for all the tomatoes, cucumbers, and apples you can grow with marvelous canning recipes for sauces, pickles, and chutneys. My Grandma’s name was Edna Oldershaw Irwin and her recipes reflect the character of the food in 1920s Canada where she grew up in Chatham, Ontario. After months of effort, I’ve prepared 64 of her recipes for publication. 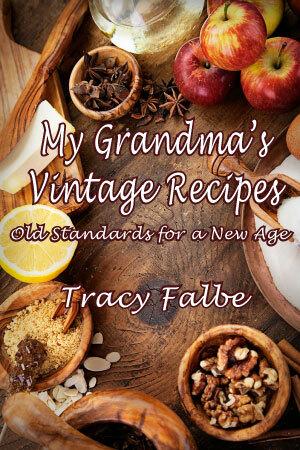 I no longer have my Grandma, but I still have her cookbook and now you can read it too.